The Canadian Rocky Mountains of British Columbia and Alberta: Spectacular. Amazing. Breathtaking. Alluring. Gorgeous. Spellbinding. If you have never been, you must add it to your to-do list. Nature and God’s splendor are in full view in every direction as you travel through this land. 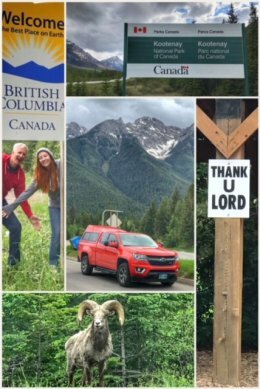 We left the trailer behind in Colville and took the long drive up, first into Kootenay National Park, where we saw several bighorn sheep and a grizzly bear cub ON the highway, with his momma trying to get him back to safety. Signs all along this stretch of the highway made it clear of two things: First, bears were active and on the highway (indeed! ); and second, stopping was NOT allowed in any shape or form. Given the bears, who would want to stop? 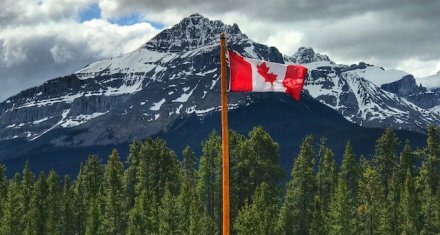 As we hit the Continental Divide, also known as the Great Divide, between British Columbia and Alberta, we moved from Kootenay National Park into Banff National Park — at an elevation of 5,382 feet. What is the Continental Divide? It is a ridge or natural boundary that serves as a dividing line for the direction water flows. With the Great Divide, water on the British Columbia side flows toward the Pacific Ocean while water on the Alberta side flows toward the Atlantic Ocean. 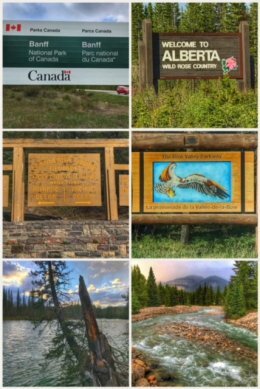 We stayed in the Bow River area, off the Bow Valley Parkway, and enjoyed magical walks to the river just about each evening. The trains also traveled along this route and we enjoyed watching quite a few travel through the gorgeous countryside; lucky train crew! Thanks to the advice from a new friend made back in Colville, our first excursion was up the Icefields Parkway. (Thanks for the suggestion K.S. Brooks!) This 144-mile highway (93N) takes you through the heart of the Canadian Rocky Mountains Parks World Heritage Site — with such sights that your mouth will stay perpetually agap, including pristine mountain lakes (all a shade of spectacular green from glacial “rock flour” runoff), ancient glaciers, snow-draped mountain peaks, gorgeous rivers and streams, and fertile tree-lined mountain valleys. If you travel the whole route, you’ll go from Banff National Park through Jasper National Park. 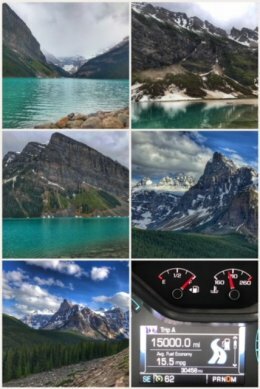 The top two pictures in this collage show Peyto Lake and Bow Lake. The bottom two pictures, above, are from a bridge over the Saskatchewan River. We tried to hike to Helen Lake (a quiet and peaceful hike through a forested valley), but too much snow and elevation stopped us before we could reach it. On our return trip south, we decided for a late afternoon visit to Moraine Lake — which was an unexpected highlight of the trip. 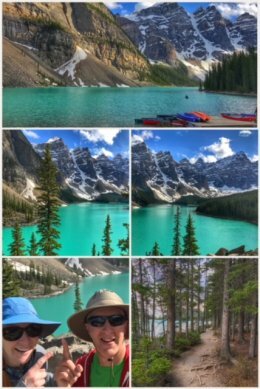 Everyone knows Lake Louise, but we found Moraine Lake much more rustic and picturesque. Situated in the Valley of the Ten Peaks, at an elevation of approximately 6,183 feet, this glacier-fed lake offers multiple hiking opportunities. We first hiked the most popular trail — the Rockpile Trail — which is along the moraine (a glacially formed accumulation of unconsolidated glacial debris: regolith and rock). The trail is fairly short, though it does have a lot of steps to reach the top… but top has the amazing views that you see in the middle two photos. (You can also veer off this trail to another trail to Consolation Lakes). 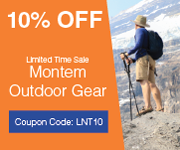 At lake level, near the canoe docks, you can find multiple trailheads and trails. We took the Lakeshore Trail, which winds around the lake through a beautiful forest for about a mile and a half (one way). During the drive, we hit 15,000 miles traveled on this trip since we began back in early January! Whew, that’s a lot of miles! 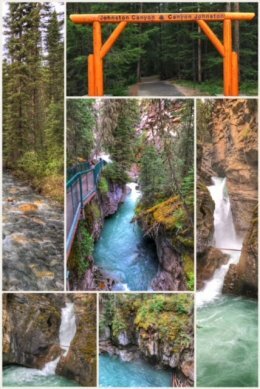 We spent the afternoon hiking at Johnston Canyon, a popular spot in Banff National Park, and located along the Bow Valley Parkway. The hike to the lower falls (which some say is the most popular trail in all of Canada) is fairly accessible and only about a half-mile long (one-way), along smooth paths and crazy catwalks bolted into the limestone cliffs of the canyon, high above the fast-moving creek. The lower falls offers a cool little cave/tunnel that you can duck through to gain a close-up look at the waterfall. If you are more adventurous, you can continue hiking to the upper falls (while also passing six other waterfalls), another mile or so, a moderate hike with an elevation gain of about 400 feet. Once to the top, you can access a viewing platform at the top of the gorge. Finally, if you are still up for more hiking, you can continue on from the upper falls trail for just under 2 miles to the Ink Pots, seven pools of green-colored mineral springs located in an open meadow. 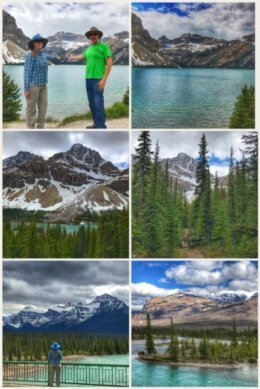 The final day of this adventure was focused on activities in and near the town of Banff, a very lovely and multicultural tourist town (with perhaps overzealous parking regulations). We spent a chunk of the day at the Banff Public Library, where Jen tackled schoolwork and Ran focused on grading. We both giggled at using the public “washrooms” nearby. After we finished our work, we headed over to the Cave and Basin National Historic Site, the location of a natural thermal mineral springs (that used to be a massive naturally heated swimming area), and historic because it is the site from which the concept of national parks formed and resulted in the creation of Banff National Park. Several fun trails are located on the grounds, and we enjoyed the interpretative boardwalk trails that explain the history, as well as plants and animals that live in this interesting environment. We had dinner in Banff at The Bison Restaurant, which sources just about all their ingredients from local sources. 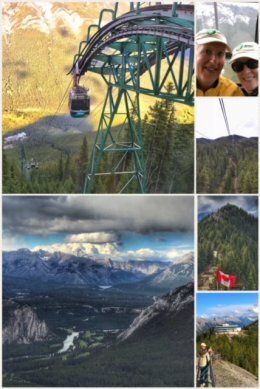 That evening we took an amazing gondola ride to the top of Sulphur Mountain — at about 7,500 feet! We had the four-seat gondola all to ourselves as we ascended to the top. 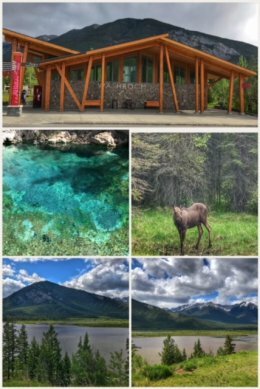 The building at the top has several levels, and includes an interpretative area (with cool video), gift shop, two restaurants, and an amazing observation patio that offers views of six different mountain ranges and a glorious overview of the entire Bow Valley. The Banff Gondola is a bit pricey (especially if you package a meal with it), but you will not be disappointed! Just wow. 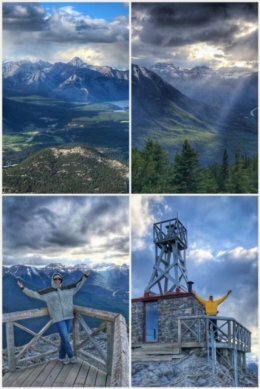 From the gondola building, we hiked up to the Sulphur Mountain Cosmic Ray Station, a National Historic Site, where geophysicists studied cosmic rays and space particles entering the atmosphere from the station from the 1950s until 1978. The hike to Sanson’s Peak is an amazing journey along a boardwalk with many steps and platforms before you reach the very top. 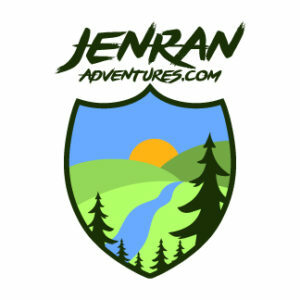 We were so blown away by the experience, we did our first Facebook Live video, typical of the goobers we are, simply because we wanted to share the joy and excitement we felt — which is also partly why we write this blog and post on Instagram… we want to inspire you to live your dreams, to go on your adventures. Finally, as we walked back to the gondola building, it started lightly snowing, making a magical evening all the more. Words cannot describe the emotions we felt. Four of the mountain national parks — Banff, Jasper, Yoho, and Kootenay — are recognized by the United Nations Educational, Scientific, and Cultural Organization as part of the Canadian Rocky Mountain Parks World Heritage Site. These four parks encompass almost 5 million acres of protected land: Banff National Park offers more than 1.6 million acres, Jasper National Park offers almost 2.7 million acres, Yoho National Park offers about 324,000 acres, and Kootenay National Park offers almost 350,000 acres… meaning you could probably spend your entire life just exploring this one area of Canada!